I don’t remember when it was, but I think I was about ten years ago when I first heard of mp3’s. Robert van der Kroft told me that he had found a way to store nine or ten CD’s on one single CD and this technique was called mp3. I had no idea what Robert was talking about; I was still into cassette tapes back then. 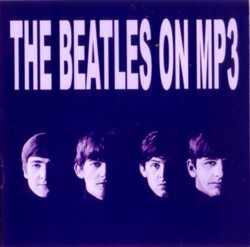 A little later I heard that one of the first mp3 CD’s was the complete Beatles collection on one CD. I have never read or heard the name of the (wo)man who made this compilation. It might be that more than one person made such a CD, but I think that there must have been somebody who was first, and whose mp3 CD is still going around the world. And I don’t think the guy/girl wrote his/her name and address on it. 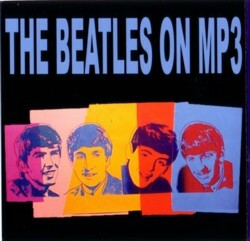 The complete recordings of the Beatles on one CD must have played an important role in the popularity of mp3’s. It sure heated my imagination that such a thing was possible! It must be a weird feeling to know that you made this important mp3 CD, but that you cannot claim any credits for it. The funny thing is that I never got a copy of this CD. Not that I did much effort to get hold of one, but I always wondered what strange powers kept me from receiving a copy. Today I was painting in an house that will be sold soon. It is almost empty, but there were a few CD’s lying on a shelf. Mainly home made copies of jazz CD’s, but also a CD called The Beatles on mp3 . I took it home to make a copy for myself, but when I opened it tonight, it turned out to be a double DVD, with 68 Beatles CD’s. That is way too much Beatles for me. I just wanted an mp3 CD with all their regular LP’s. If there are 68 Beatles CD’s on these two DVD’s, I wonder how many Beatles CD’s exist. I mean, there is always more, so I cannot imagine that these 68 CD’s are all there is. Here is a track from a CD that is not on these DVD’s. It is a song by a band called The Stars. I have one, if you want a copy!? But as far as I can remember it’s not on mp3. It does include all their albums. I don’t think the fact that all Beatles-albums fit on one mp3-cd played a role in popularising this format. The fact that mp3-files are small enough to be easily distributed on the internet was more important, I think. And of course the Beatles are one of the most bootlegged artists of all time. Were you really surprised that there are 68 albums on those discs? I’ve had a Beatles mp3-cd-rom in my posession once. I had borrowed it from one of my pupils. It was indeed about 10 years ago. It was done very nicely: after inserting a screen popped up with clickable thumbnails of the record sleeves of all their official albums. Hi Jan, if Ican find it, I make you a copy as well. I would advise everyone to use the Purple Chick Deluxe editions. Every album + the singles distributed along the albums, both in stereo and mono, all from vinyl.